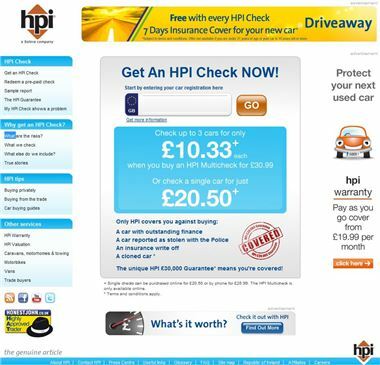 HPi is offering 30% off registration checks until November, encouraging buyers to check a vehicles history before handing over the money to buy it. Dark nights provide the perfect cover for unscrupulous sellers, with the low light levels helping to hide tell-tale signs of dodgy cars, like mismatched colours, dents, dings, scrapes and uneven panel gaps. But even if you view in broad daylight, as you always should, it’s best to check the cars history for things like outstanding finance. To help buyers ensure the car they buy is honest and straight this Halloween, HPi has lowered the price of its vehicle checks. To take advantage of the offer you need to quote FRIGHT30 when you call HPi on 0845 301 1816 or visit the website.